The week of April 26-May 3 is National Infant Immunization Week and it is also the 20th anniversary of this observance. Vaccinations are becoming a more controversial topic among parents, doctors and schools. The New England Journal of Medicine suggests that the recent anti-vaccination movement is leading to an outbreak of whooping cough and the measles in some states. 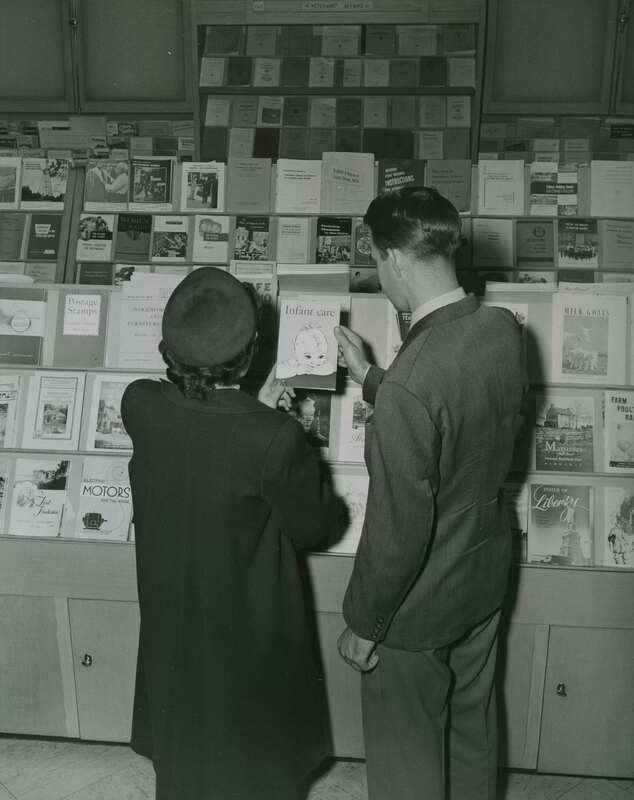 A couple looks at Infant Care pamphlet at GPO Bookstore: GPO Archives. Before you could Google information on vaccinations and family healthcare topics and have every answer at your fingertips, government publications were the go-to source for consumer information. This former trend is evident in the fact that a pamphlet entitled Infant Care is still to this day considered GPO’s all-time best seller. Infant Care was first published in 1914 by the Children’s Bureau and provided mothers with information in a low-cost form on how to care for their babies. (Read more about the history of the Children’s Bureau in The Children’s Bureau Legacy: Ensuring the Right to Childhood (ePub eBook) available on the U.S. Government Bookstore.) Over the course of seven decades it remained a bestseller with multiple editions published and translations in eight languages as well as Braille. 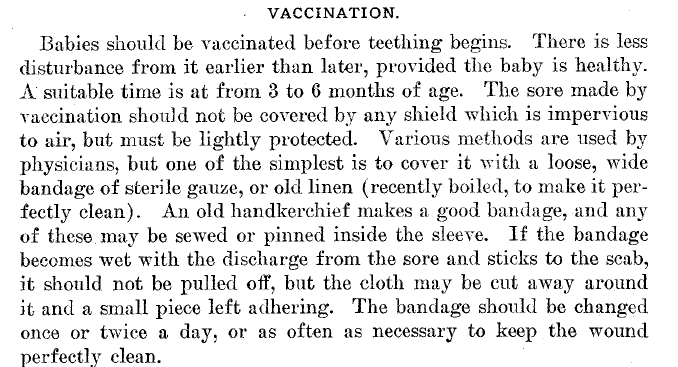 100 years ago, this was the advice on vaccination of infants. Excerpt from 1914 Infant Care pamphlet. The original Infant Care pamphlets can be seen on this archive. However, Vaccines for Children (VCF), a federally funded program handled by the Centers for Disease Control and Prevention (CDC) provides no-cost vaccine services to help ensure that all children, from infancy to adolescent, have a better chance of getting their recommended vaccinations. Like Infant Care, the government still has helpful publications to help parents and the public make health-related decisions. Parent’s Guide to Childhood Immunizations and Immunization Tool Kit are just two of the many government publications available on the immunization and vaccination topic. Parent’s Guide to Childhood Immunizations is kind of like a “vaccinations for dummies.” It is a great resource that explains each disease, the vaccinations schedule, what to do before, during and after the immunization doctor visit, how vaccines work, other FAQs and additional print and electronic resources. The most helpful part of this booklet is the breakdown of each disease with information on what causes the disease, how it is spread, the signs and symptoms and complications. To brighten up what can be a scary subject, the booklet includes colorful child artwork. 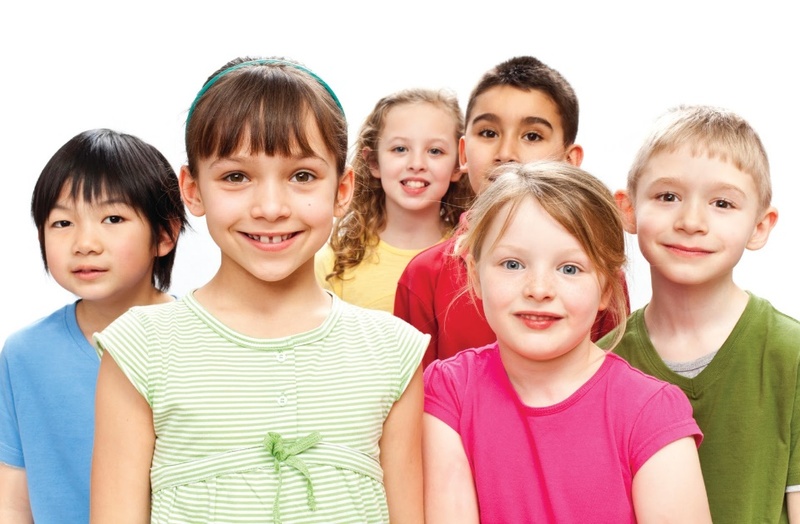 Immunization Tool Kit focuses on adult, military and childhood immunizations. This resource is made up of laminated 4X6 color coded cards held together by a ring for fast flipping making it durable and likely intended for military or health care providers, people who need a quick reference on the job. The cards are organized by immunizations for adults and the military and children with detailed information about each vaccine including a dosage, indications or who should get the vaccine, contraindications or reasons why someone should not be vaccinated and special considerations. Some of the cards have amusing caricatures of what the diseases look like. For medical personnel, there is a section on the storage and handling instructions of each vaccine. While the amount of information may seem overwhelming, the toolkit will be able to answer all or any question about vaccines. HOW DO I OBTAIN THESE PUBLICATIONS ON VACCINATION? Guest blogger Nancy Faget lets us know about a great resource delaing with women’s health. I’m a lazy reader. Yes, I am primarily a scanner more than a reader. (I hope this doesn’t put me in danger of losing my status as a librarian!) 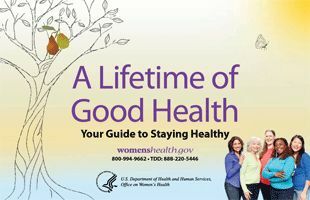 I appreciate a lot of white space and concise writing, which is exactly what the HHS Office of Women’s Health (OWH) has achieved in this new publication: A Lifetime of Good Health: Your Guide to Staying Healthy. 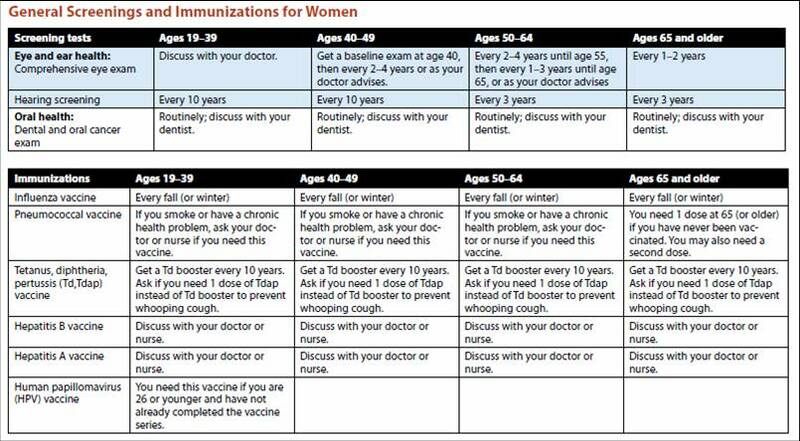 This publication provides reminders, highlights, and checklists for any female at any stage of life (immunizations through Medicare services). The checklists beginning on page 6 are great tools to help you keep up with tests and immunizations. Did you know, for example, that they recommend a TDP vaccine every 10 years? OWH has produced a slick new publication hitting all the high points. It’s worth having available in any family’s stash of medical reference material. You’ll find it to be a great handy reference and an easy read – I promise! To read (or scan!) A Lifetime of Good Health, or for more great information on any health issue, contact your local Federal depository library for assistance.